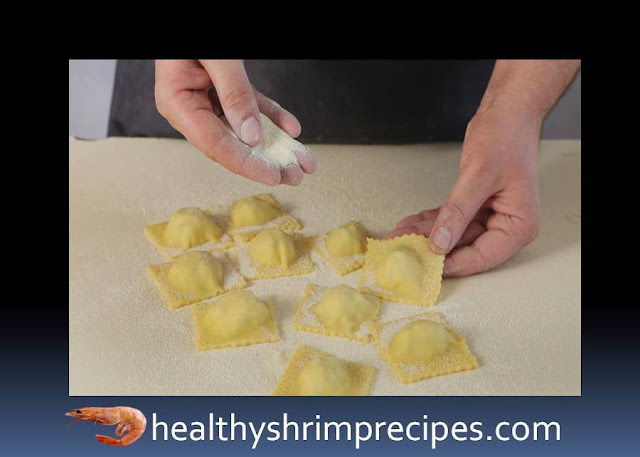 Here is ravioli with shrimp cream sauce recipe that will be equally good for a romantic dinner, and for a family dinner. The difference is only in the amount of serving and serving. 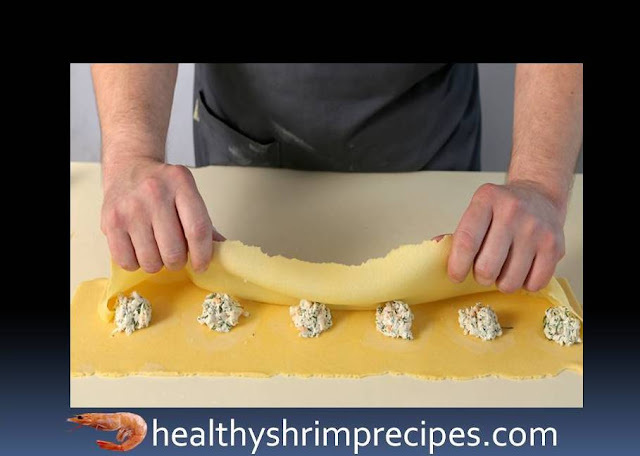 A loved one and family will undoubtedly appreciate this Ravioli with shrimp cream sauce dish, where the Italian form is so well and to the place filled with stuffing from the gifts of the northern seas. 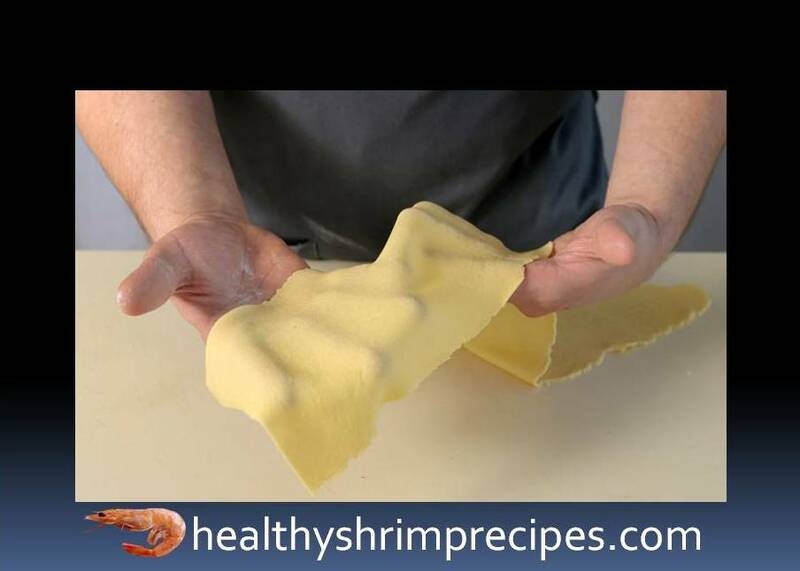 @Step 1 - Start by making ravioli dough. In the bowl of a food processor, mix the flour, eggs, salt and olive oil to form a large crumb. Put the crumbs on the table and knead until smooth. Cover the dough with a cotton towel and leave for 30 minutes. @Step 2 - For the fillet of chira fillet, fries in a frying pan with vegetable oil. First, from the side of the skin under the lid, 2 min. Remove the lid, turn the fish over and cook another 3 minae or until full readiness cool it down. Remove all the bones from the chir. Disassemble the fillet into medium pieces. Transfer half of the fish to the bowl of the blender, add the cream and grind until smooth. 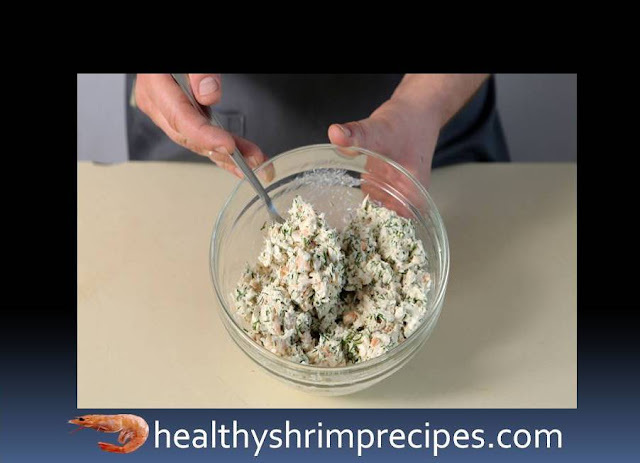 @Step 3 - Mix the remaining fillet with shrimp and chop to the consistency of large minced meat. Add finely chopped dill. 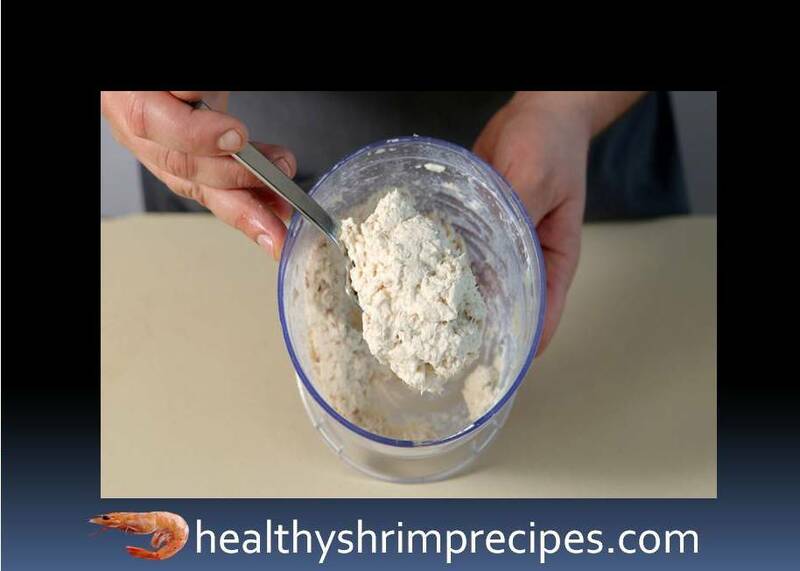 Mix with shredded fish mass and Salt and pepper refrigerate for 20 minutes. @Step 4 - Split the dough in half. 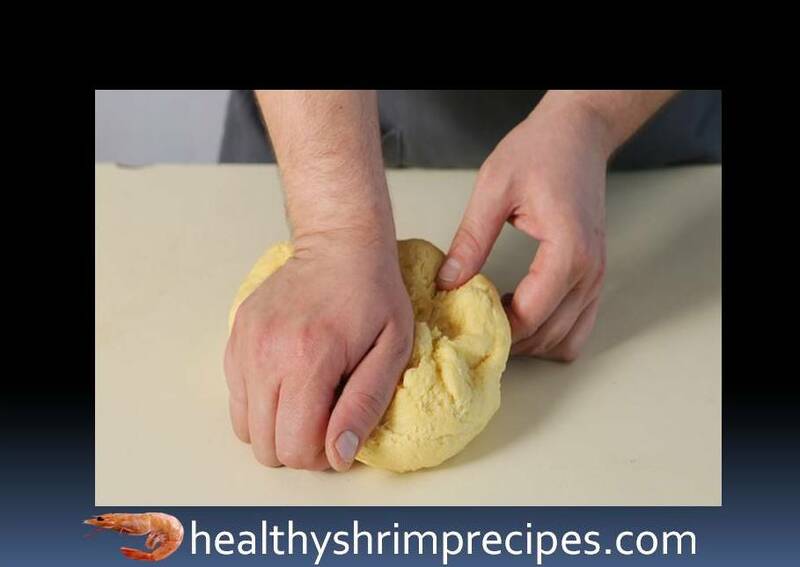 Pass it through a special machine, rolling the dough into a thin layer. Or place between two sheets of baking paper and roll out with a rolling pin as thin as possible. You should have two long thin rectangular layers of dough. @Step 5 - Put one layer on the table, another side and covers it with a towel. Cut the first layer into 2-3 long ribbons about 7 cm wide. Spread the filling on the tape (0.5 tsp) at some intervals. @Step 6 - Wet a finger in water and circles it around the filling or moistens the dough with a silicone brush. Immediately after that, carefully put a second tape on the prepared blank. Take the dough around the filling so that the two layers stick together. @Step 7 - Use a sharp knife (better round for pizza), cut the billet into squares. Also, make ravioli from the remaining dough. @Step 8 - Ready to roll in semolina, scattered on a large flat plate and do not forget to shake off the remains of semolina. 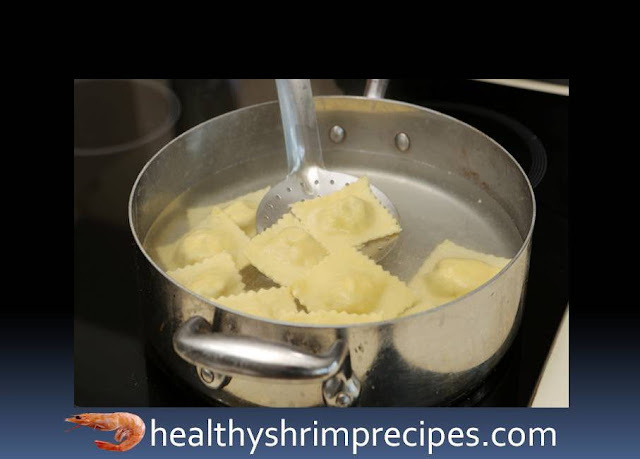 @Step 9 - Boil the ravioli in a large amount of boiling salted water, 4-5 minutes. Fold the ravioli in a large bowl, sprinkling with melted butter and lemon juice. 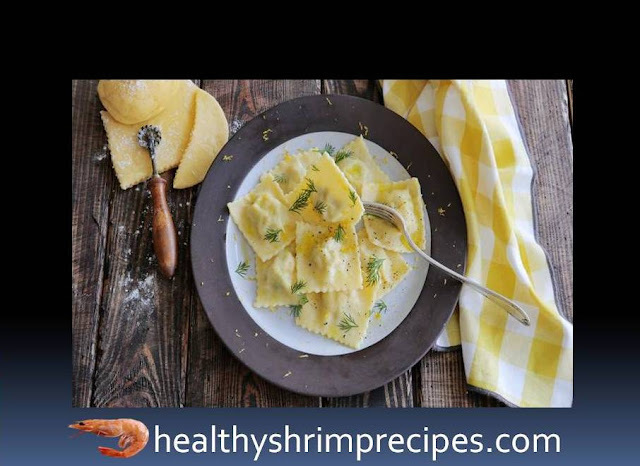 Serve hot, Ravioli with shrimp cream sauce decorate with finely chopped dill.